Even though the holidays are over, there is one last thing we would like to share to keep the spirit going. 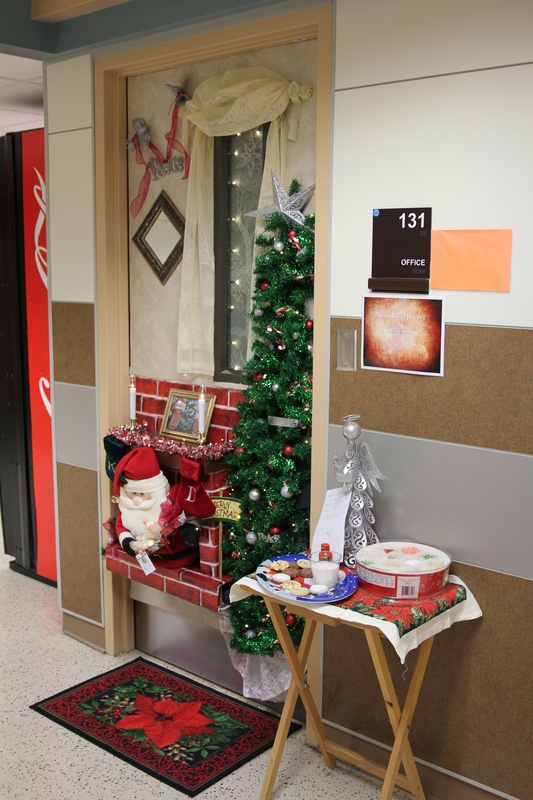 An interpreter at San Antonio College used Regal Plastic’s Foam Board to create an elaborate Christmas door decoration. Her efforts won her first place in their office competition! Her story is so well told that we thought it should be shared. “I did use Regal Plastic’s product, the foam core sheet. I have used it in the past for Christmas Door contests for my mother when she was in an assistive living facility before she passed away. Because of my experience before using paint and material glued to the board, I decided to try to make my door this year at work. I wanted to make it 3D by using the foam core. I first measured the door and cut out the window to incorporate it into my design. I wanted to express that the best “Gift of all was Christ” so I made a fireplace and found a stuffed Santa Clause at Walgreens to come out of the fireplace. I used self-adhesive shelving paper on the upper half of the door to make it look like wallpaper and a plastic brick paper to make the fireplace. By making it 3D I was able to place battery operated lights behind the Santa so it looked like the fire was behind him, the battery box was hidden in the bottom of the fireplace. I used hot glue and duct tape to make the fireplace and hold it together. I then used garland to make a tree using hot glue to attach to the wall paper, and added battery operated lights to the tree. The battery boxes were hanging from the door handle behind the garland so you could not see them. I put lighting on the inside of the door window and covered with a shower curtain material that looked like a winter scene, the same material was used for my drapes on the outside of the window. I also placed plastic battery operating candles on the mantle. The mantle was covered with wood looking shelving paper, self-adhesive, and hung stockings. I then made a gift box with poster board the size of the baby doll and wrapped the baby with material from the shower curtain so it looked like a swaddling cloth. I placed a gift tag on the baby saying “To: You, From: God”. I only used the tape that Regal Plastics recommended to hold it on the door. It stayed up the whole 2 weeks even though I came in and out of my office. The tape came off easy, several people in the office used the tape as well and were very pleased how easy it came off. I did have to use something to help on the metal part of the door on the inside window, but other than that it was easy to dismantle.